Good: Great high-quality design that screams of being a premium product. Tons of hits and serial numbered rookie cards in each pack, equating to considerable value despite the lofty price tag. Bad: Considering the state of the economy, $300 is an awful lot to pronounce on one box of cards, thereby limiting the audience for 2009 Bowman Sterling Football considerably. There aren't an excessive amount of plain vanilla game used memorabilia cards which don't exactly fit with the premium theme of the set. 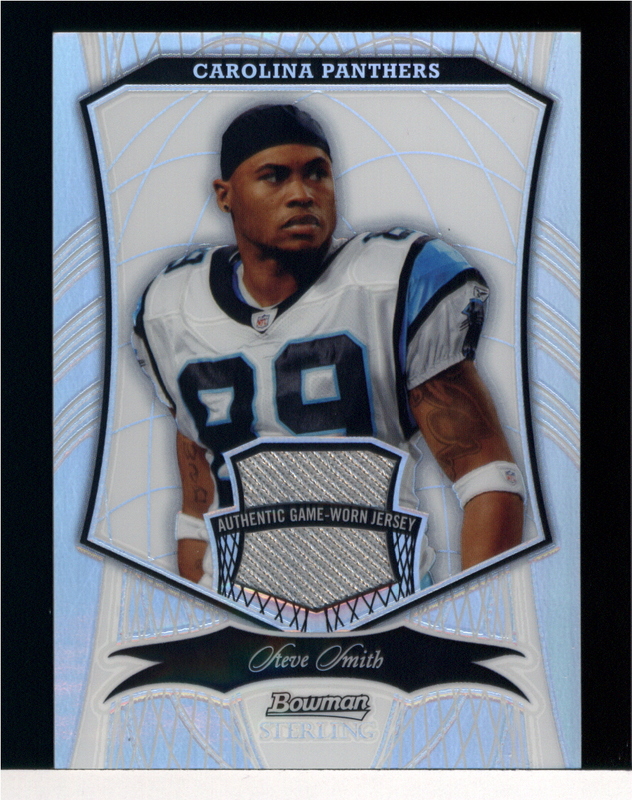 The Bottom Line: The Bowman Sterling brand is a perennial premium card powerhouse and 2009 Bowman Sterling Football does well to carry on the torch. However its steep price tag will limit its audience considerably. There is not much innovative about this product. 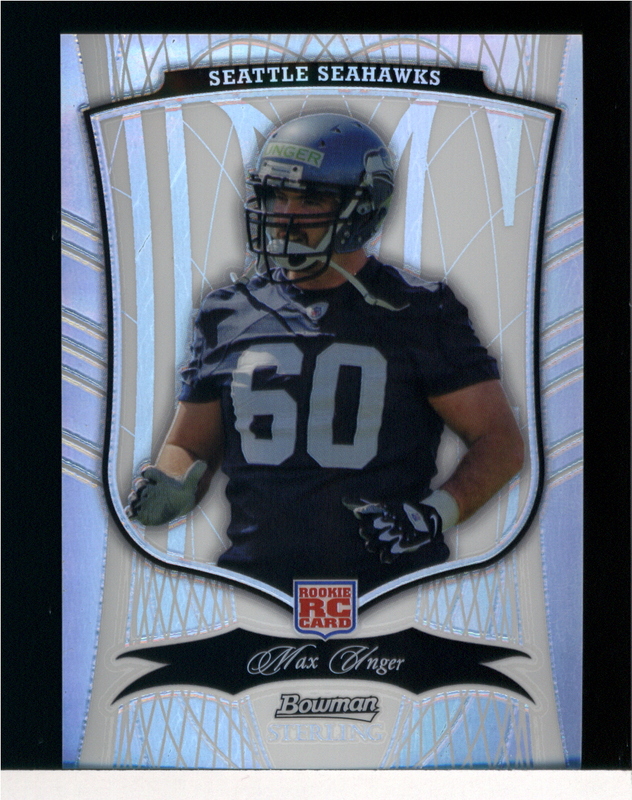 If you like past Bowman Sterling Football card sets and are looking for more of the same type of spans, albeit updated for 2009, then 2009 Bowman Sterling Football is the way to go. Personally, if I had $279 to spend on football card products I would rather use the money to buy three boxes of 2009 Topps Chrome Football and a box of 2009 Upper Deck Heroes Football. 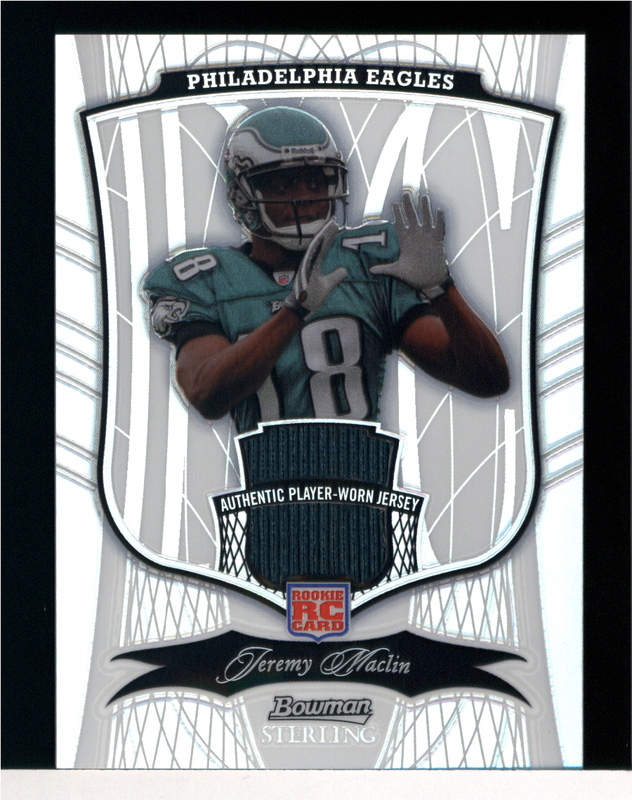 Design wise Bowman Sterling always delivers and 2009 Bowman Sterling Football is no exception. Each high-gloss card features a player surrounded by a variety of different metallic patterns and designs. The players are portrayed very crisply and really pop off the card. Even the standard game used memorabilia cards look nice as a result of the sets high-class design. The checklist is strong from a rookie and star standpoint. This is a very rookie centric product with the majority of cards in each pack being various rookie base cards, refractors, game used jersey cards and autographs. 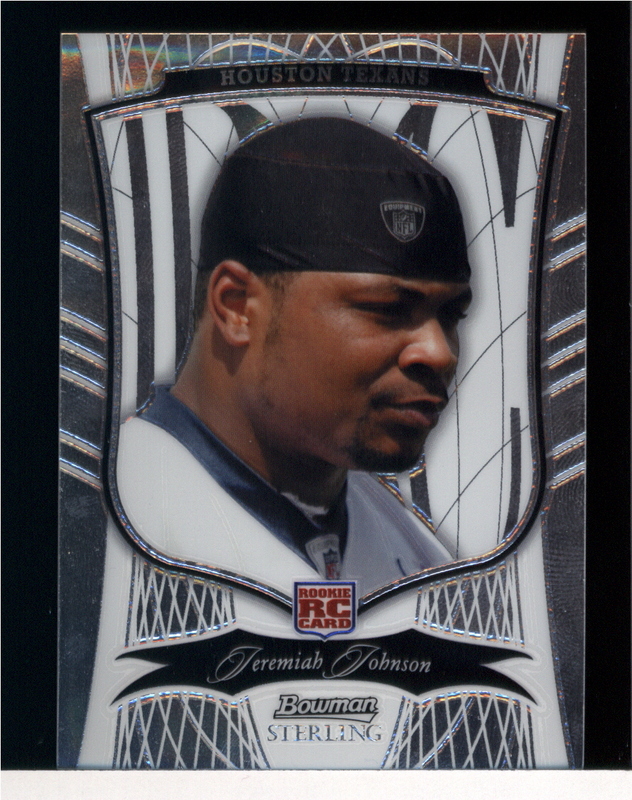 2009 Bowman Sterling Football has every notable member of the 2009 NFL draft class represented in its checklist. Complementing this impressive assortment of rookies is a nice mix of current NFL stars. Don't expect to find many cards of retired NFL players, although that is actually not a bad thing as 2009 Sterling Football is much better suited to a modern checklist than a vintage one. Because of the almost $300 price tag it's easy to jump to the conclusion that Bowman Sterling Football isn't much of a value. 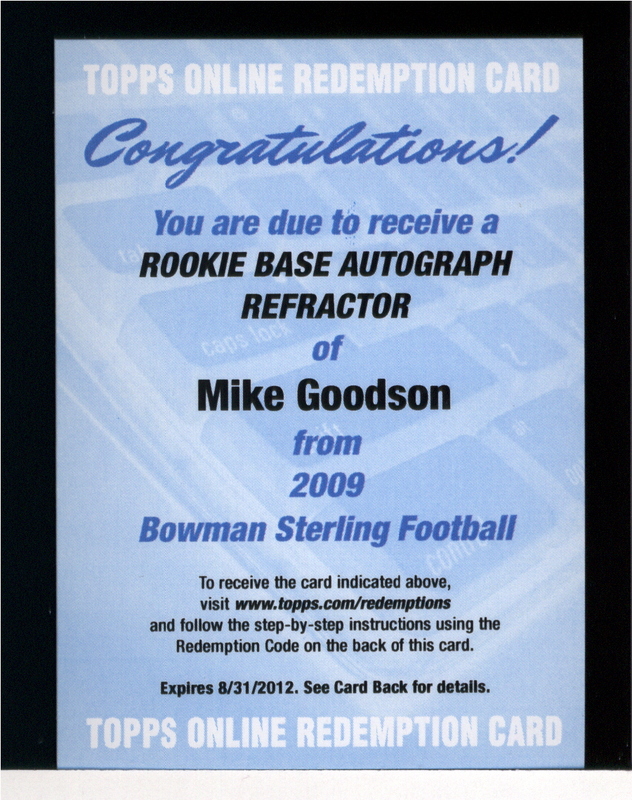 Although there are far better ways to stretch your collecting dollar then 2009 Bowman Sterling Football, if you are in search of a premium football card product this is probably the best deal in town. Most high-end sports card products contain one or two packs per box, with each containing one or two autographs or a memorabilia cards at most. This year's Bowman Sterling Football set on the other hand boasts a whopping 18 hits per hobby box. When looked at in this context it is an excellent deal. However, when compared dollar for dollar to good lower end products on the market I like the options available at the mid range, under $100 price point more. 2009 Bowman Sterling Football suffers from the same drawbacks as other high-end products, in that the box breaks are very brief. There was the added excitement of knowing I was breaking a product filled with thoughts of potential big-time hits, and the net result is that I ended up having a good (but not great) time breaking it. 30 Rookies and 30 Veterans in blue and green variations serial numbered to 10. The 4 plates used to make each of the 85 Rookie and Veteran Relic cards, as well as each of the 50 Rookie base cards. Each printing plate is serial numbered 1 of 1. The 4 plates used to make all 50 Autographed Rookie cards. Gold Refractor cards featuring dual autographs in various combinations of 40 current and past NFL stars. All dual autographs are serial numbered. 2009 BOWMAN STERLING FOOTBALL FACTORY SEALED BOX. HOBBY ONLY PRODUCT! 2009 BOWMAN STERLING FOOTBALL HOBBY BOX NEW FACTORY SEALED! !